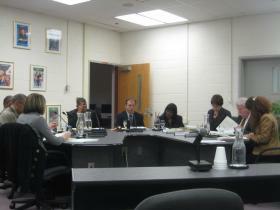 The Ypsilanti Public Schools' Board of Education during their meeting Monday night. Mar. 9, 2010 · 3:52 a.m.
Budget reduction plans for Ypsilanti Public Schools are planned to be announced during a special board of education next week. After Monday night's board meeting, Superintendent Dedrick Martin said next week's special board meeting is tentatively set for 7 p.m. March 17, but could change based on board availability. Next week's meeting will be the first time the board, as well rest of the community, hears the formal restructuring plan as a whole. The board will then consider the plan for approval at the regularly scheduled board meeting on March 22. The board passed a four-year deficit elimination plan to eliminate more than $6 million from the district's budget in December. The plan recommends the district lay-off 41 teachers among other cuts to athletics and district support services. The next academic year is expected to contain the brunt of the cuts, estimated at nearly $5 million. Two separate restructuring plans could result in the closing of two elementary schools or one elementary school and one middle school. Both options maintain an all-kindergarten school, currently Perry Child Development Center, and grades nine through 12 at the high school. From there, both plans diverge. Details on how the board has been pursuing the plan were revealed during discussion on a resolution proposed by trustees Andy Fanta and Kira Berman. The resolution, which was not included on the agenda and brought up for consideration at the meeting, would have required the administration to present numerous other plans considered by administration and the reason they were not recommended. The resolution, which was discussed before the action items on Monday's agenda, did not garner enough support from board members to be added as an action item, which would have required an up or down vote. Berman said a motivating factor for her support of the resolution was an ad hoc committee meeting held late last month that reviewed the administration's preliminary plan. She said she was given two hours to review the material and the information handed out by the administrators was recollected after the meeting ended. If passed, the resolution would have required administrators to present the board with concrete data on all the options it had considered before arriving at its yet to be announced plan, including those plans suggested by community input. “I think we should be talking with a wide variety of community groups about a positive vision,” Berman said. Berman said she understood the urgency in which a plan needs to be approved but also the importance of approving a quality plan, even if it means a little more time. Aside from Berman and Fanta, the rest of the board voiced opposition to approving the resolution. Most sited timing for their opposition, as the resolution was put forth at the meeting, not providing adequate time to review the legislation, in their opinion. Martin said there has already been much community involvement in formulating a plan and the process has been made transparent. He said the district's deficit elimination plan, budget and other information have been placed on the district's Web site. In addition, he pointed to the two community forums held, the public survey on the Internet and the input session held last month. He said a final plan has not been announced yet and decisions need to be made as soon as possible so the district can adequately follow through with a plan. Board President David Bates, as well as other members of the board who voiced opposition to the resolution, stated they did agree with the spirit of the legislation and the information it requested would be expected in next week's presentation anyway. “I sort of find this unnecessary,” Bates said. Berman said the ad hoc committee meeting she, Bates and Trustee Floyd Brumfield attended on the issue gave her the impression the information requested in the resolution would not be included in a presentation, but voiced optimism about what trustees said they expected in next week's plan. The meeting held last month was the first meeting held by the ad hoc committee. After Monday's regular board meeting, Martin said another ad hoc committee meeting is planned for this week. He said the meetings are being held so there is some board reaction to the administration's plan and presentation before being made public. He said last month's meeting helped to point out mistakes and holes. Martin said the second and final meeting of the ad hoc committee this week will be in a similar format and for similar purposes.